In 1871 The Great Fire of Chicago ripped through the city leaving massive destruction in its path. As the city began to rebuild the architects pushed the envelope with new innovative structures. The Rookery Building was one of those structures. Daniel Burnham and John Root were commissioned in 1885 to design a building for the Central Safety Deposit Company. Burnham and Root’s building was inclusive of metal framing, fire proofing (can’t really blame them, right? ), an elevator and plate-glass. The Rookery stood at an impressive 11 stories tall, the tallest building in Chicago at the time. 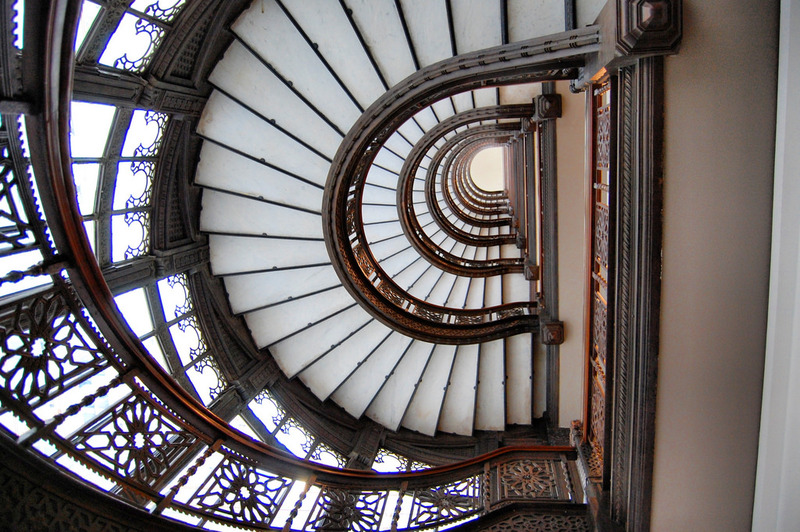 The Rookery is now considered the oldest standing skyscraper in the city of Chicago. The Rookery has had a few face lifts over the years with renovations in 1905 by Frank Lloyd Wright, a 1931 update by William Drummond, a 1992 12th story addition and lastly a LEED Gold certification in 2014. Wright’s work was why I made a stop at The Rookery. I am a fan of Wright’s work and will make every effort possible to see his work while I am traveling. 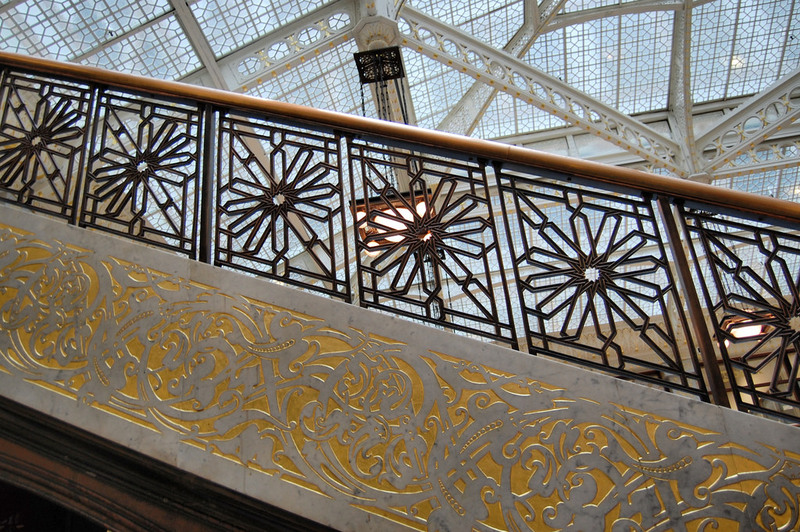 Although the building’s details were impressive in the original design, Wright added his mark on the building with gilded white marble detailing, bronze chandeliers and prismatic glass. I am not going to lie, his updates to the building are a little over the top, specifically the marble detailing. The 1931 renovation by Drummond changed the building by incorporating the trendy art deco style and separating the lobby’s entrance in to two stories thus creating more rentable office space. 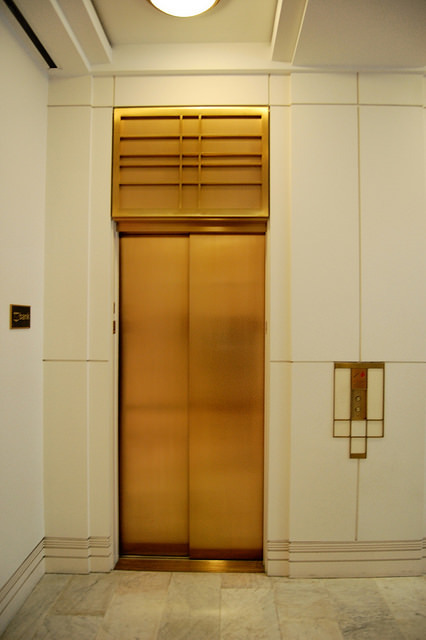 He also removed Wright’s open cage elevator doors and replaced them with solid bronze doors. 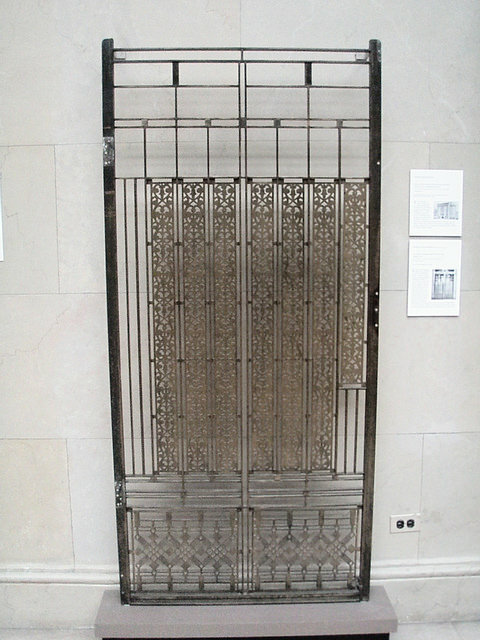 For any Wright “purists” out there you can still see Wright’s elevator doors on display at The Art Institute of Chicago or in the photo below. In 1988 L Thomas Baldwin III purchased The Rookery with the intent to restore the building back to the Burnham/Root and Wright eras. 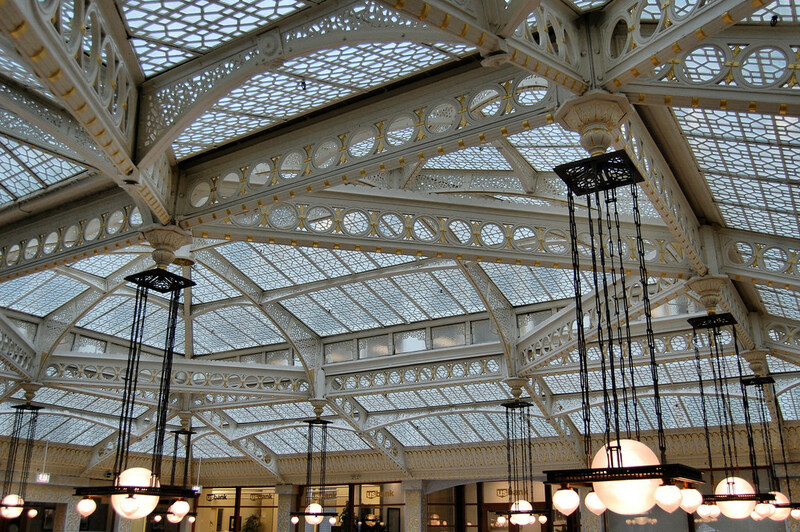 In addition to opening back up the lobby, the glass ceiling in the light court required quite a bit of restoration. Tar had been used to seal leaks, which had to be then removed, returning the light court back to its glory days. A twelfth story was also added. The restoration was completed in 1992. You can take a tour of The Rookery that is short, simple and to the point. At only 30 minutes you get a brief history of the functioning office building, touring the light court, the second floor mezzanine and a peek at the famous Oriel Staircase. The tour starts out in the light court at the base of the marble covered stairs where you are encapsulated in natural daylight. 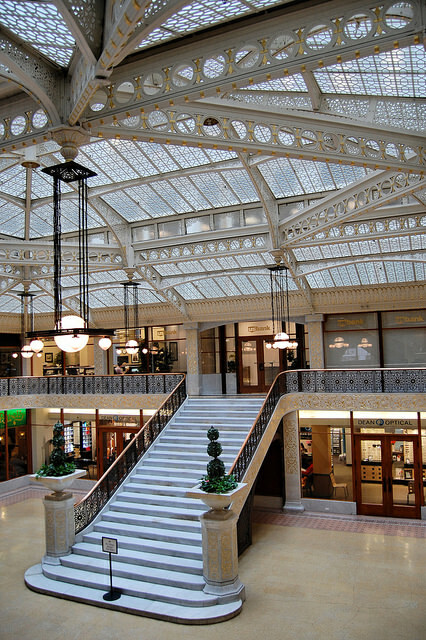 While in the light court you will have an excellent view of the glass ceiling complete with Wright designed hanging lights and the gilded marble detailing. Probably the most impressive part of the tour is looking up at the Oriel Staircase as it winds its way up the inside of the building. Guided tours are offered Mondays, Tuesdays, Thursdays and Fridays at noon only for 30 minutes. A guided tour of The Rookery light court and Burnham library is offered Wednesdays only at noon for 45 minutes. Reservations are highly recommended. 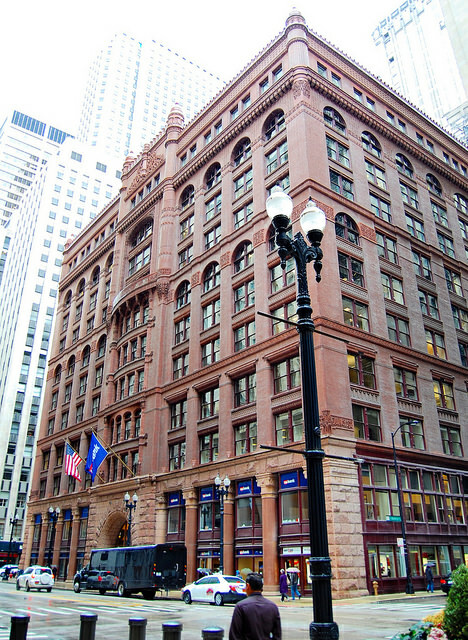 The Rookery can be found at 209 S LaSalle Street. Tagged Chicago history, frank lloyd wright, skyscrapers in Chicago. Bookmark the permalink. My husband took a trip to Chicago and loved the architecture, but I’m not sure if he saw this building. Thanks for a wonderful glimpse inside. The natural light in the light court is quite impressive and gives the building a truly unique look! I love seeing some of these old buildings being restored and learning about the history behind them. I’ll definitely look it up next time we are in Chicago. Thanks for linking up to #WeekendWanderlust. Chicago has some really great architecture along with a lot of Wright buildings – which I love! My brother’s office is in this building – fun you checked it out!